After suffering two tough road losses to Duke (3-0-1) and North Carolina (6-0-0), the Fresno State soccer team was once again shutout this weekend by Oregon State and Oregon. On Friday, Fresno State (0-4-0) was just always one step behind the up-tempo Oregon State Beavers with the final score 3-0. Even though things did not go the ‘Dogs’ way, Fresno State head coach Brian Zwaschka was pleased with the progress of his team. Oregon State (2-0-1) executed quick, fast, and early with a goal via a cross by forward Nikki Faris, and put in the back of the net by forward Mariah Roggow a minute and a half into the game. In the 17th minute, Fresno State had an own goal scored off the foot of Rianna Cota in a congested box. Oregon State’s final goal came in the 35th minute when Fresno State’s goalkeeper Domenique Banta was beat out in a one-on-one situation by the Beavers’ forward Emma Jones from a long pass by midfielder Sabrina Santarossa. Fresno State stayed with the same routine as the first two games by switching out goalkeeper Domenique Banta for freshman Marie Beriwinkle-Kottmann. The freshman goalkeeper gave up no goals and had two saves. Although it did not show on the scoreboard, the ‘Dogs showed physicality and aggressiveness throughout the entire match, something Fresno State did not have in its first two games. Fresno State got off eight shots with three on goal. There were a total of 19 fouls from the ‘Dogs and they were given four yellow cards. 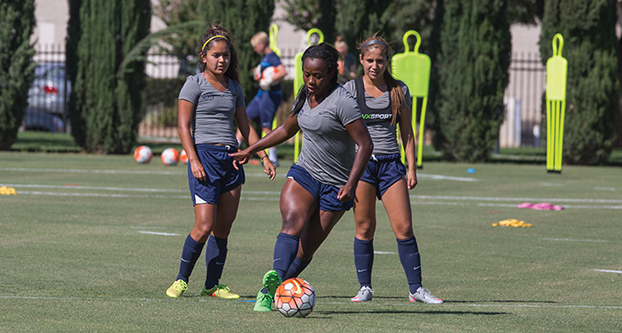 In Sunday’s match against Oregon, Fresno State lacked offensive power. The ‘Dogs could only muster up five shots with three being on goal compared to the Ducks’ 20 with seven being on goal. The ‘Dogs on goal shots came from seniors Sam Brechman and Alyssa Cruz and junior Angie Weiner. The ‘Dogs played solid defense in the beginning. For the first time this season, Fresno State went into the half without giving up a goal and being behind. Berwinkle-Kottmann got her first start of the season as goalkeeper for the ‘Dogs. She is the first goalkeeper for the ‘Dogs this season to start and finish an entire match. Berwinkle-Kottmann had a career high six saves in the match, bringing her total to 15 for the season. It wasn’t until late in the match when the Ducks (1-3-1) got on the board. Oregon forward Taylor Kuroda received a pass from Mia Costa on the right side of the box and slipped it passed Berwinkle-Kottman in the 74th minute for the only goal of the match. Next up for the Bulldogs will be their home opener against Cal State Northridge (3-1-0) Sept. 4 at 7 p.m. at the Soccer and Lacrosse Field.